Beauty Boxes can be very hit & miss, with frequent repeats so I don't subscribe to any and prefer to buy as & when they interest me, once I know what is in them. I find the mini products very useful when I am going on holiday, but also the sizes are usually generous enough for me to get a good enough impression of a product and whether or not it suits my skin/hair and if I like it, which is especially useful when it comes to expensive products. 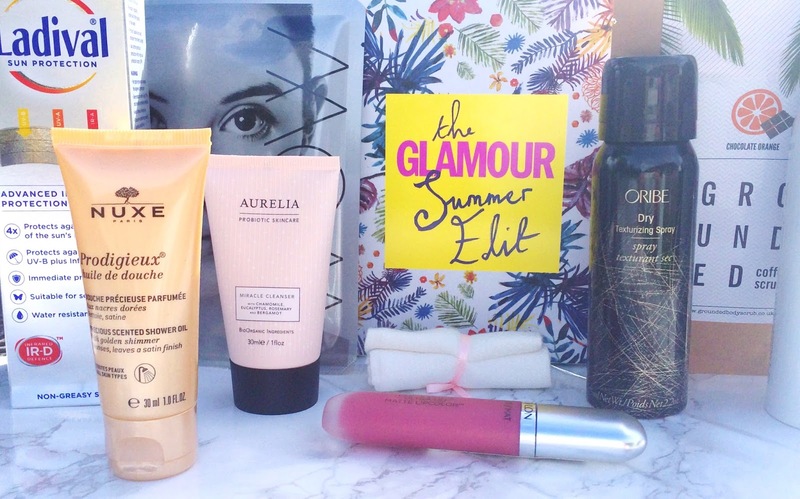 Case in point is the new Latest in Beauty Glamour Summer Edit Box - as soon as I saw the Oribe Dry Texturising Spray, I knew I had to buy it because I have wanted to try the Oribe product for a very long time. The box is priced at £20, yet the products have a value of £104 so I can safely say that this is a bargain! Like I mentioned, the first product to grab my attention was the Oribe Dry Texturising Spray, which is priced at £19 in stores, which means the 7 other products cost only £1 more. This is a much raved about, much hyped product so I am excited to try it. I was also excited to see a full size Revlon Ultra HD Matte Lipcolor in the shade Devotion. I have seen this featured on a lot of other blogs recently and although it doesn't appear to be matte, the colour is really beautiful so I am very happy to have this in my collection. I saw Tijan talk about Grounded Body Scrub in one of her videos recently and she said that her skin felt really soft and smooth so I am very excited to use this and will let you know my thoughts. If you read my Five cleansers for dry skin post last week, you will know that I love Aurelia Miracle Cleanser so I was delighted to see a 30ml tube in this box because it will be perfect for holidays. There is also a bamboo cloth in the box, which I already know I love too. 30ml is a great size for anybody who is new to this product because you can get a good feel for it and a little goes a long way with this cleanser so it will last quite a while. Another product that will be perfect for weekends away or holidays is Nuxe Prodigieux Shower Oil. I tend to use budget shower gels/oils so this will be a nice treat and if I like it, I might buy the full size. As a face mask addict, I am really looking forward to WOW Mask Luxury Facial Mask. This mask promises to deliver instant anti-ageing results - I'll let you know my thoughts when I use it! It's always handy to have an extra bottle of SPF and this box contains a 150ml bottle of Ladival Sun Protection Spray in SPF 30. I haven't tried this brand before so I am hoping that it will suit my sensitive skin. There is also a bottle of St Tropez Self Tan Classic Bronzing Mist in the box, which I will be sure to use later in the summer, but at the moment I am still quite tanned from my holiday to Orlando last month. Also included is a £10 discount code for Aurelia Probiotic Skincare and some discounts for Nuxe, St Tropez, WOW and Grounded and finally, a chance to win a 7 day holiday in Majorca. Overall, I think that this box represents fantastic value for only £20. If you are interested in buying one, you can do so here. I would love to hear your thoughts on the products in this box and on beauty boxes, in general. Do you have any subscriptions or do you think they've had their day? Please tell me in the comments below!